Dive in & join the fun with new Babybel Spirolls: Nutritious real cheese snacks spun into a smart spiral shape for lunchboxes, snacks and on-the-go-fun. 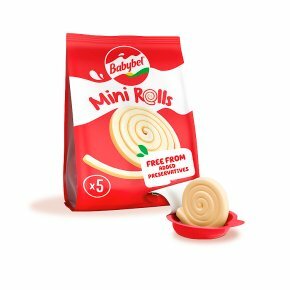 Real and tasty Babybel cheese: All the mild delicious taste of Babybel?wound into a spirally snack: excellent for twirling and swirling, whirling and curling! With all the goodness you'd expect from the Babybel family because they're: Nutritious: We use 125 ml of milk to make one Babybel Spiroll, and so they're rich in protein and calcium. Free from added colours, flavours and preservatives: It's vegetarian cheese too, and naturally lactose-free. Lunchbox-friendly! Babybel Spirolls love lunchboxes and are happy out of the fridge for a few hours. They're individually-sealed and easily-portable in packs of 5 so weekday lunchtimes and on-the-go snacks are sorted! Watch out: To avoid choking hazards for children under 4, cut into bite-sized pieces.